Certain ancient Romans had the words of the title to this post inscribed on their funeral monuments (above is one example, using slightly different wording). They may be translated as: "I was not; I was; I am not; I care not." This epitaph is attributed to Epicurus. 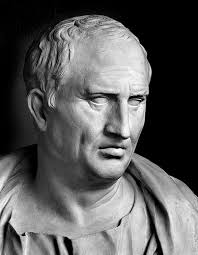 Being a Greek born in the 4th century BCE, it's unlikely that he ever spoke or wrote these Latin words, but likely enough that he did so in the Greek of the time. It seems an Epicurean sentiment. Lucretius and others have praised Epicurus for ridding mankind of the fear of death which arises from certain religious beliefs--those which maintain that, on death, unbelievers or those violating particular standards will suffer eternal torment in particular. Epicureanism and Stoicism were the most popular philosophical positions in the Roman Empire, from what we know. There's a certain admirable brevity in this blithe statement. If indeed nothing awaits us after death, if we are in fact nothing then, it's clear that we would not care about anything at all. Someone must exist in order to care about being dead. We didn't exist before we were born, and so had no cares then. We recall nothing before we existed. Why should it be different after death? Indeed, it seems odd to even speak of ourselves as entities which existed before our birth or will after our deaths. It's not clear to me it makes any sense to do so. If we were or will be anything, we won't be what we are now, i.e. people who can be spoken of as people. 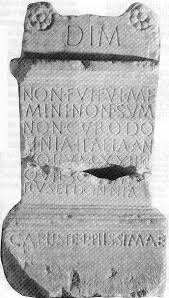 Other surviving "tombstones" from the Roman era urge those who stop to read them to enjoy life, eat and drink well, while they can. The implied assertion, if it's not expressly stated, is that we have only one life and it should be lived as pleasantly as possible. These statements also have an Epicurean ring to them. These are not sentiments commonly expressed by or on behalf of the dead these days, and have not been common for quite some times, with some exceptions. Since the advent of Christianity, the tendency is to express hope in everlasting life in a vaguely defined heaven, among its vaguely defined residents, doing vaguely described things which seem to relate primarily to worshipping and contemplating God (also vaguely described). Just how much comfort did the ancients derive, and can we derive, by accepting the apparent position of Epicurus that we will feel, think, do, and experience nothing at all when we die? Is the thought that we will simply be gone, soon enough, all that comforting? Perhaps it's better to be gone than to roast in hell for eternity. But the end of ourselves wouldn't seem to be something most of us would find satisfying. Some may well find the idea that they will stop existing frightening, in fact. Contra Lucretius, some may insist that religious belief can liberate us from the fear of nothingness, of dissipation, which is all we're promised by Epicurus. Perhaps the cessation of their lives (and of themselves) didn't disturb the ancients as it seems to disturb us. It has seemed to disturb us for quite some time, in fact, judging from views held by a number of well known persons after what's called the scientific revolution and the Enlightenment, when belief in the God of Christianity became increasingly difficult for them to maintain. I think of Nihilism, Existentialism (or what they're commonly thought to consist of) and those who wonder what the meaning of life really is or whether it has any meaning. Romanticism seems to have encouraged the glorification of self, and that would seem to make the belief that the self will vanish in a short period of time rather daunting. Do we love ourselves more, now, than we did in the ancient past? Is that self-love responsible for our proclivity to despair of life given the indifference of the universe, and yet fear death? The Stoic view of death is different from the Epicurean, different from the Christian, and different from the modern. Marcus Aurelius calls out the distinction between the Epicurean and Stoic view of the universe generally with some frequency. Either the universe is simply the random result of atoms and the void, or the universe is divine, providential, infused with reason. We as parts of the universe partake of the divine, and having the capacity for reason may by using it act in accordance with the divine plan. On death, we remain part of the universe, though we may dissipate, and so continue to participate in the divine universe though our individual personalities may not survive or may survive for a period of time only, not for the life of the universe. There are claims made that the later Stoics tended more towards the view that our personalities survive and that God was more personal than believed by the earlier Stoics. For me, the Stoic view is one that doesn't incite despair or fear but instead inspires an acceptance of the universe, our fate, and our eternal place in a living reality. "As Swimmers Into Cleanness Leaping"